Geometric or naturalistic glass designs work well in both urban or garden spaces, either blending in with the surroundings, or standing out in stark and dramatic contrast. Transparent glass adds an other-worldly dimension to a garden or public space and can provide a focal point for contemplation and reflection. Most of our outdoor glass artwork is supported using stainless or raw steel structures. The latter can be left to rust naturally, finished with clear or coloured coatings, or galvanised to give a pewter-like rust-proof finish. 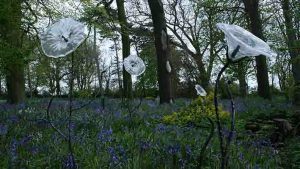 Glass can also be combined with frost-resistant ceramics and wood to make robust garden sculpture. 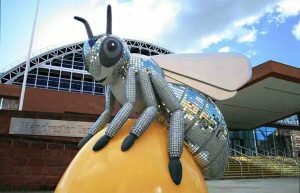 Outdoor structures may also be decorated with mosaic, we decorated this fibreglass sculpture for the Bee in the City Trail in Manchester with mirrored-mosaic using specialised grouts and adhesive.